In the last ten years, the nearest I’ve come to communion was a few days ago when we ventured into Oakland to check out the famed Casserole House. This stretch of Telegraph Ave, by the way, has a handful of Korean places right next to each other, all competing for your palate with mouthwatering pictures of their food (much like the signs of rivaling churches along a suburban street with their promises of giving meaning to your life and/or rescuing your soul from eternal damnation). We had just sat down in a comfy, quiet booth when the waitress plonked down literally dozens of appetizers in little bowls – first, a Korean variant of potato latkes, then several types of tofu, sweet pickled beans, tiny oily fish, hardly bigger than matchsticks, sweet potatoes, broccoli, omelette, pickled bok choi and crunchy radishes, and miso soup. We could hardly believe our luck. Instead of going for cow intestines or squid as main dishes, we had made the scared beginners’ choice of beef and pork bulgogi – mounds of incredibly soft, fragrant, thin slices of meat, surprisingly light and almost fluffy in their consistency, not so boring after all all. But all this was just a preface to the meal’s real climax – the Communion rite. Suddenly, a wise and friendly-looking woman appeared at our table and introduced herself as the cook. 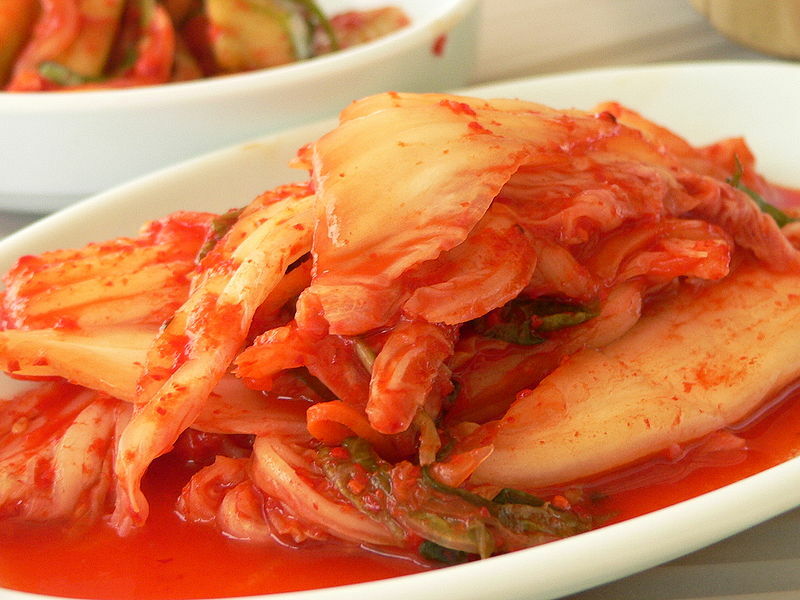 Between our main dishes – as the glorious centerpiece of the table – she placed a plate of Kimchi, and while reciting a litany about the virtues of said pickled cabbage (“Is four month old! Is special Kimchi!”), removed the lid from my rice-bowl and asked me for my chopsticks. She took the chopsticks from my hands, gingerly tore off a leaf of cabbage from the serving plate, placed it on my rice and mixed the two. The sage/cook pointed at the printout of a newspaper article that hung in a frame on the wall above our table – it was a page-long ode to the Four Month Old Kimchi in front of us! And we were happy. She held up the Kimchi, cooed “Say Aaaaaah!” and then, with a friendly nod, placed the cabbage-and-rice ball in my opened mouth, and indeed I “bowed [my] head before the Sacrament as a gesture of reverence, and received the consecrated host on the tongue” (I stopped at the “Amen”, though, replacing it with a nodding “Mmmmmmh!”). A spiritual experience is one that one cannot be put into words. We’ll be back for the squid! what a fantastic piece of food-writing. I take off my (nonexistent) hat to you and kimchi woman.